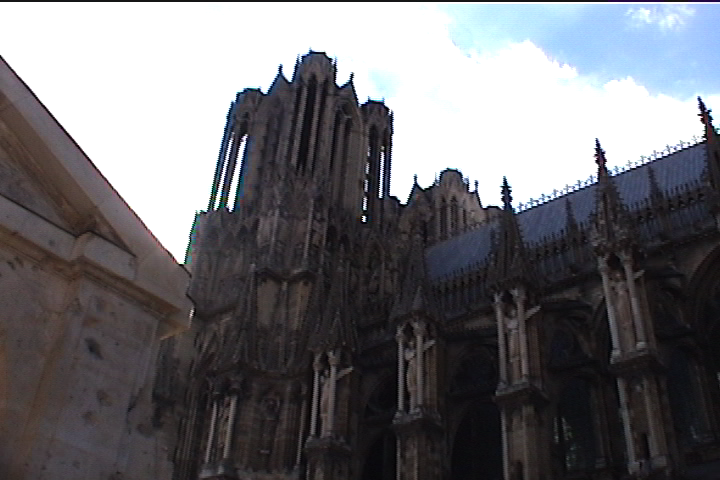 Self-described as: “The City of Coronations and of Champagne,” Reims’ historical roots go back to the conquering of Gaul by Julius Caesar, who came across a fortified site occupied by a mighty Gaulish tribe known as the Remes. The tribe struck an alliance with the Romans, and was rewarded with the status of capital of the local province. 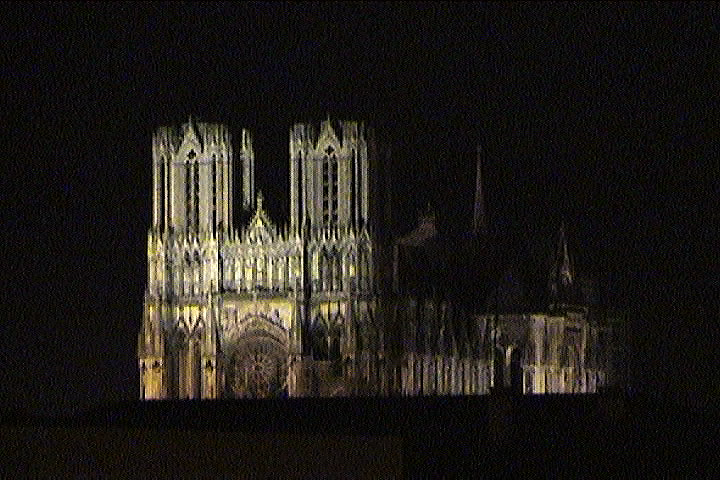 Though it might be impossible to believe, the largest Roman Arch of Triumph is here in Reims, not Rome. Known as the Arch of Mars, built about 200 A.D., it still stands. 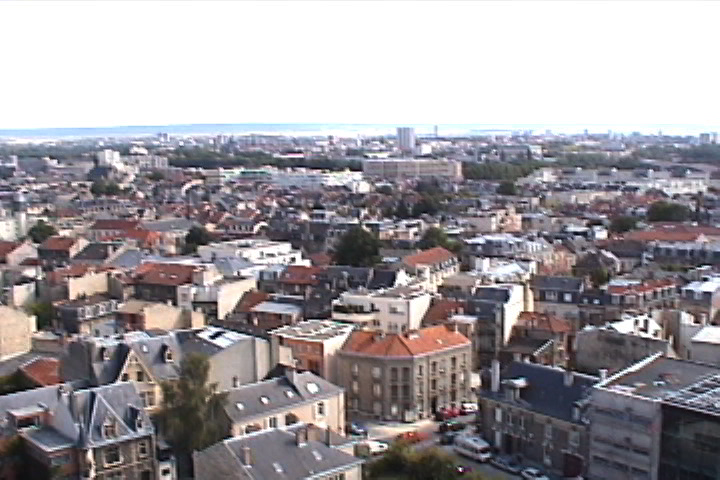 The city is approximately 144 kilometers (89 miles) northeast of Paris, located in the province of Champagne. The city gained fame when St. Remi, the apostle of the Franks, converted and baptized the Frankish King Clovis in 498 A.D, bringing that Frankish monarchy into the Christian fold, and inaugurating a long tradition of royal coronations. Probably the most famous of these coronations was that of Charles VII, who was brought to Reims by Joan of Arc in 1429, after fighting her way through English lines. Some more recent history is rather full of ironic turns. Napoleon won his last battle here, over the Russians. 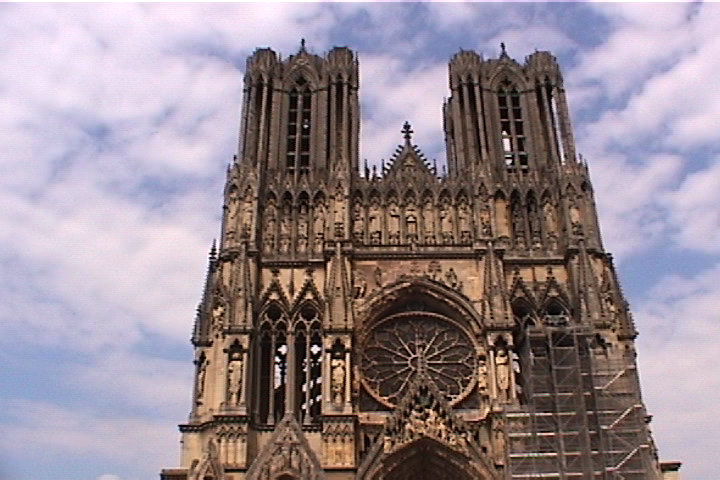 During World War I the city was heavily bombarded for four years, and it was here that, in 1945, Reims was the scene of the German surrender, which put an end to World War II on the European front. 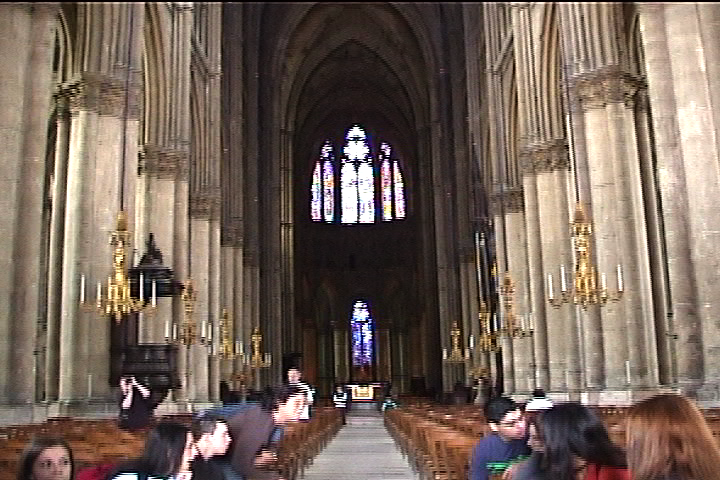 The church occupies the site of the church in which Clovis was baptized, and in which the early Kings of France were crowned. The building as we see it today was begun in 1211 and, except for the towers, was finished in 1294. The almost twin towers were completed in 1428. A tower over the crossing was destroyed in 1914. 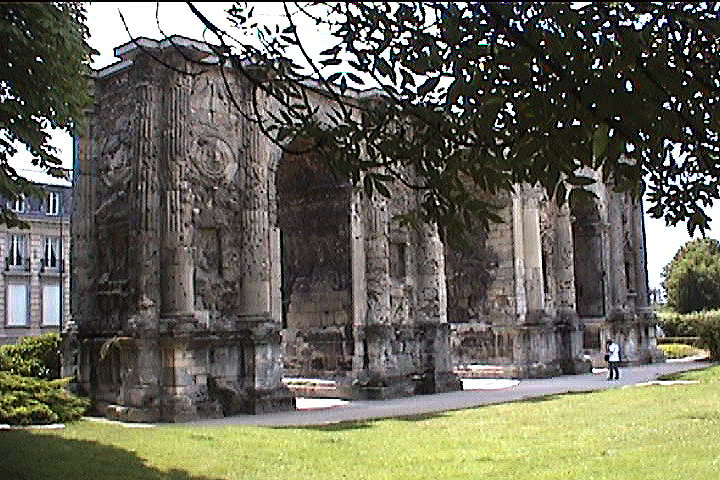 It is said that the western façade contains five hundred statues, the most notable of which are the royal figures. 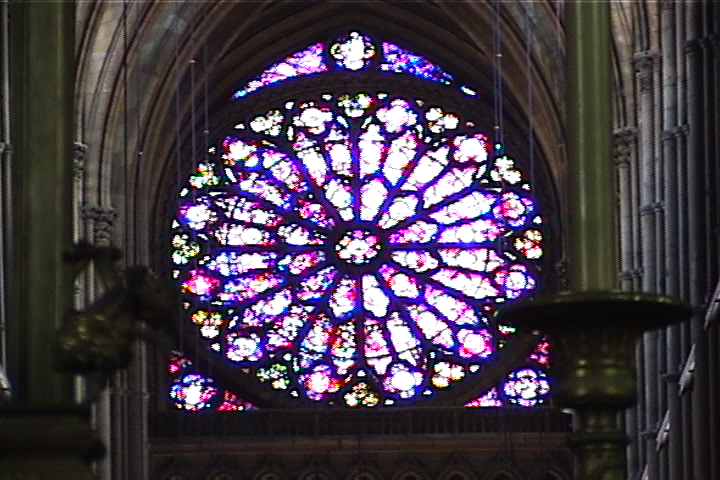 Those images of the Kings of France are placed under tabernacles, in the gallery above the Rose window. The architect of this façade was Bernard de Soissons. The three portals are created almost as narthex-like enclosures, for they project out of the building, as opposed to the usual cutting into the wall of the façade. 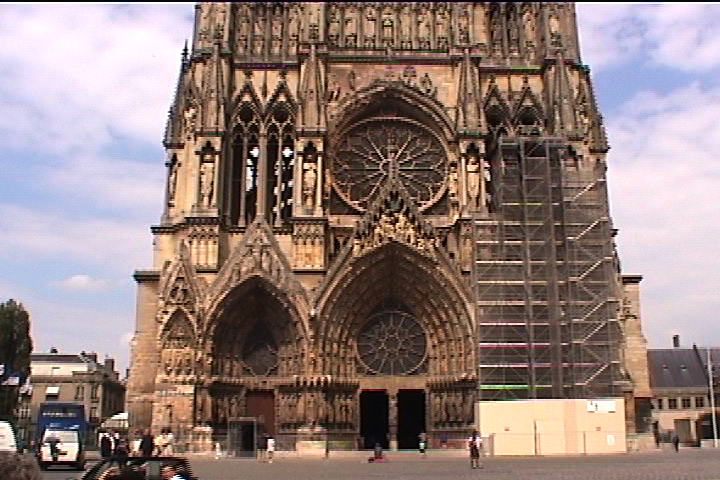 See Chartres for similar construction. 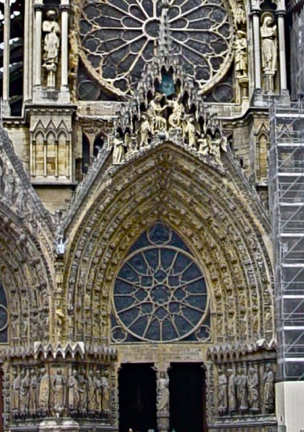 Above each door is a Rose window. The building exterior is almost wholly composed of statues. The sculptures represent some of the greatest achievements of medieval craftsmanship. The sculpture on the center portal depicts the life of the Virgin Mary. 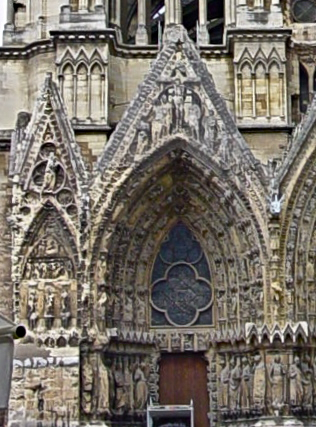 The left portal houses what is locally known as the “Smiling Angel Statue” (“Sourire de Reims”). There are actually four angels, but the one on the right of the left-hand side is the "Smiling Angel." 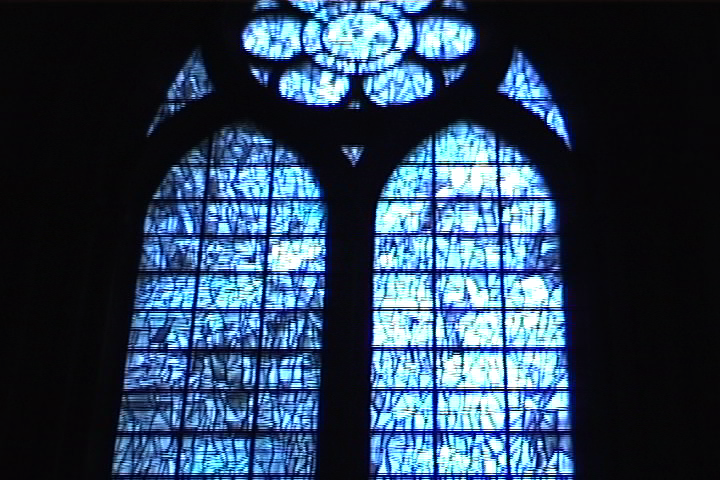 Most of the original stained glass has been destroyed (the W.W.I bombardment), but some have been restored. In 1974, Marc Chagall created six new windows. 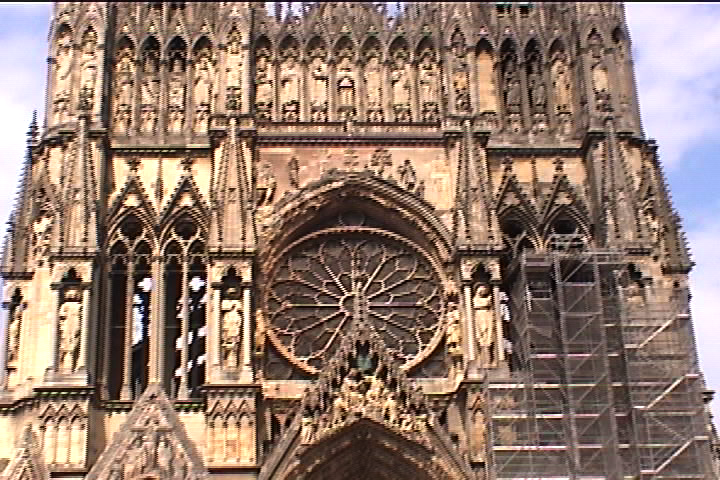 The Reims Rose window measures 12 meters (40') in diameter. The towers stretch upwards – without spires, as is so common – 82.5 meters (271'). Nave to altar overall length is 138.5 meters (454'). 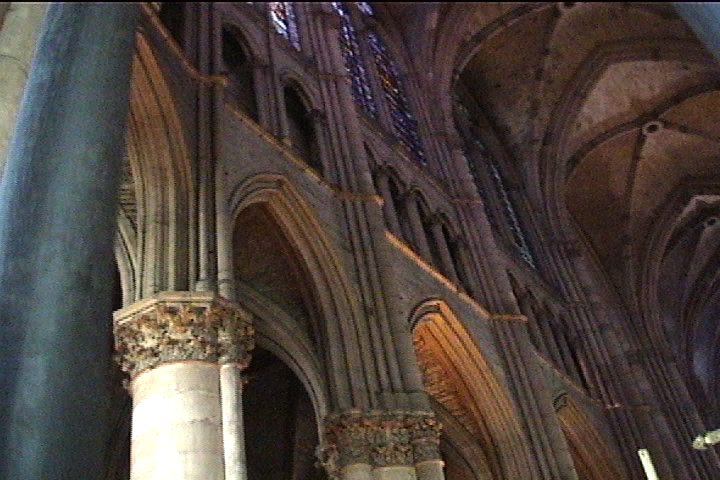 The width begins with three aisles at 30.5 meters (100 feet'), and increases to five aisles at the transept to 50 meters (164'). This width increase was for the purpose of accommodating the coronations. 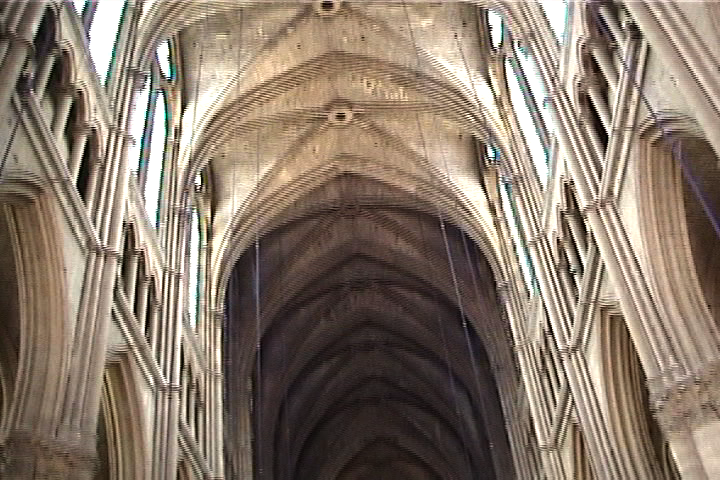 The interior nave vault soars to a height of somewhere between 38 meters (125') and 40 meters (131'). 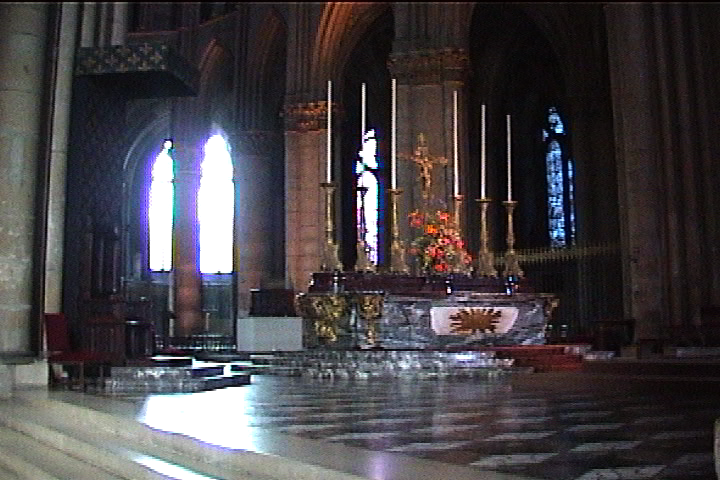 There are five radiating chapels in the apse, and this area influenced the design of Westminster Abbey’s chevet. 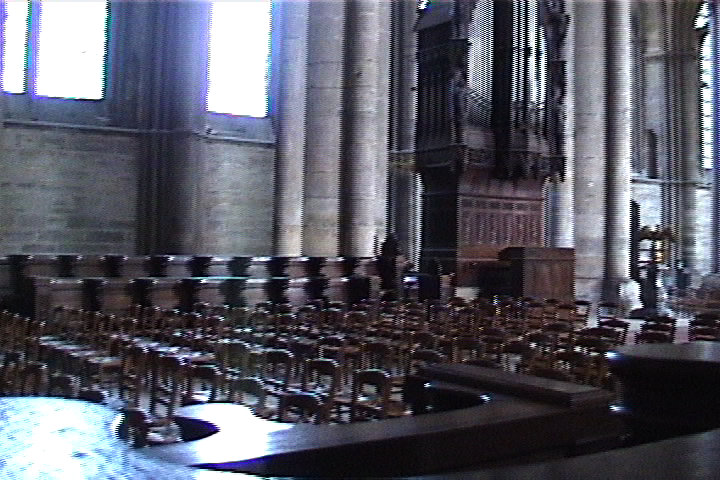 While negatives were not presented in our discussion of Chartres, contrast can be made here with that church. 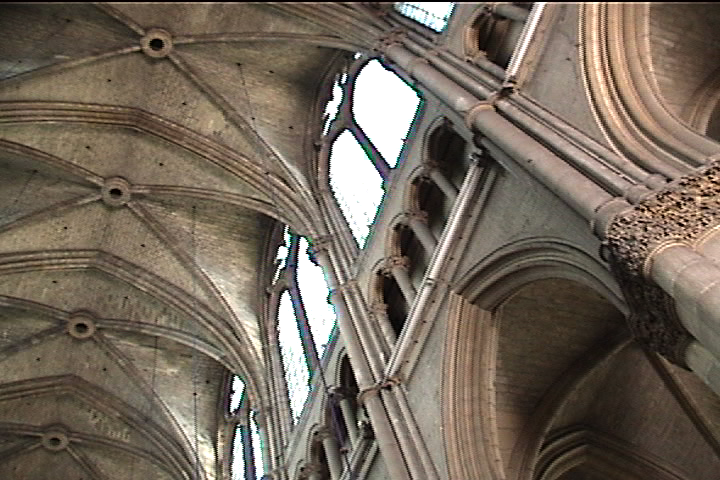 In Chartres there is more exposed wall surface, eliminated here in the nave by more pointed lancet-type arches. Angularity in Chartres is replaced in Reims by curved forms. Plane thicknesses seem diminished by receding profiles of articulated arches. We are dealing with an evolution of architectural construction and design; actually the two are the same. 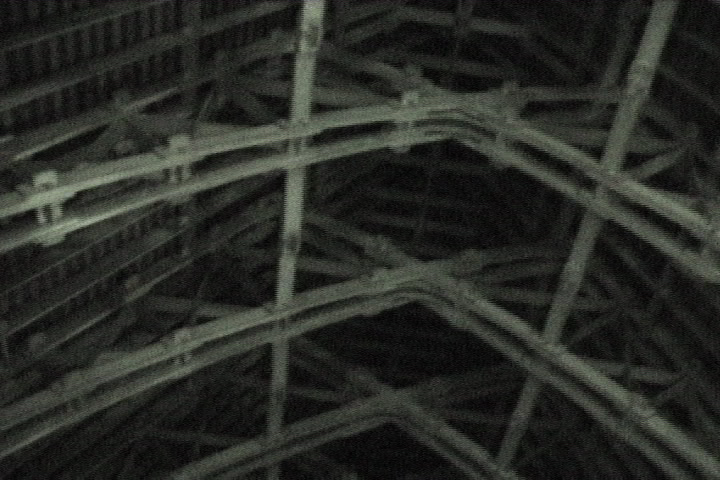 This rather unique shot was taken above the stone vaults of the nave. What has to be understood is the fact that stone vaults are not waterproof. There are just too many joints between the thousands of stones, each of which was chiseled by hand, and are multi-faceted to interlock with surrounding stones. The vaults, therefore, had to be covered, and what we see from outside is a peaked roof, with slanting sides. 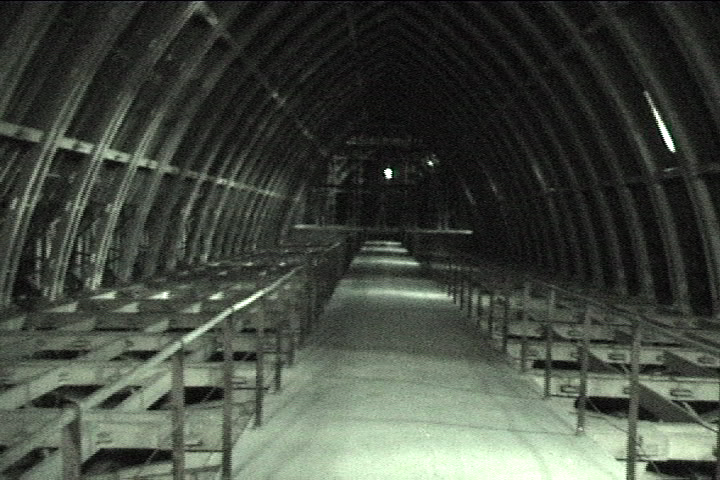 This photo is inside that roof area. The construction is reminiscent of ship construction, but upside-down. 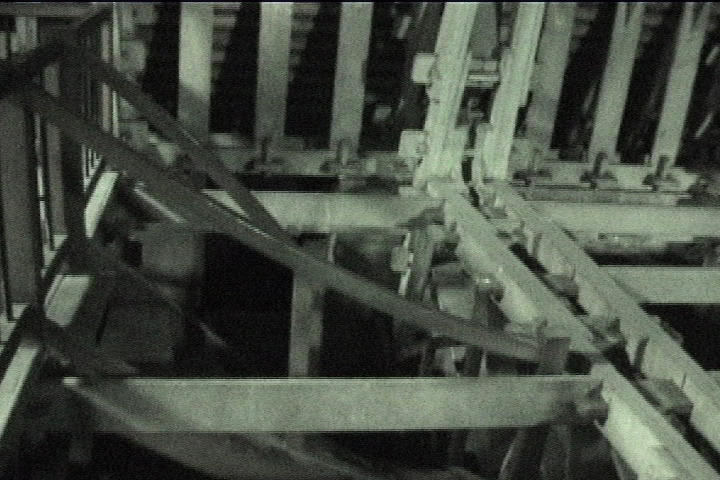 Imagine the hull of a ship turned upside-down, and you have the framework shown here. Everything visible is wood construction. There is a central flat walkway which spans over the stone vaults, and is supported at the sides, thus clearing the underside of this walkway from the stone below. 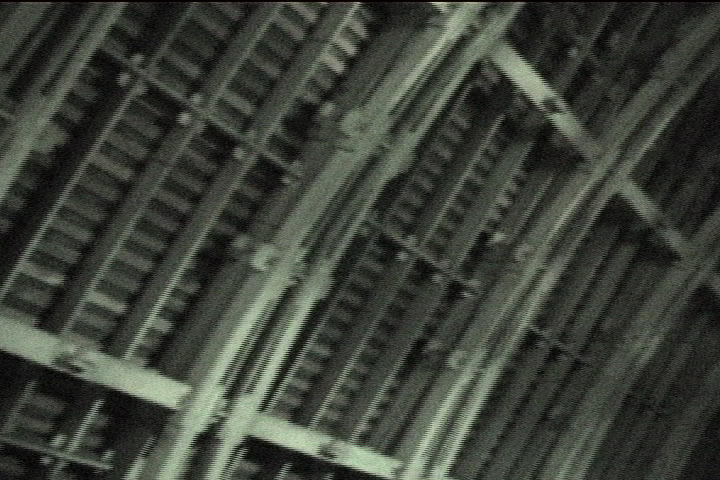 Truss-like supports – almost like a giant spider's web – interlock and support the sloping roof above. The side construction in closer detail. Truth be told here, I have no idea of the age of the roof construction, but the church was heavily damaged during World War I, and I would imagine what we are looking at is a result of subsequent reconstruction. The question remains, however, as to the authenticity of the reconstruction. Judging by what we see, it seems likely that work was probably done authentically. What should be enlightening, of course, is the actual space above the stone vaults, and the making of the final roof construction. 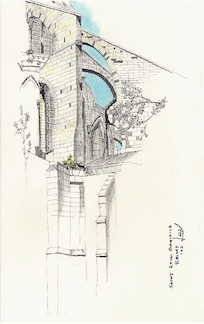 The sheer delicateness of the stonework of the flying buttresses, which allows the sky to enter into the composition, like a magnet, compelling me to sit down and sketch. It is when you sit and sketch that the exact nature of the work becomes so much more apparent and clear, and you come as close as possible to the actual masons who crafted this structure stone by chiseled stone. 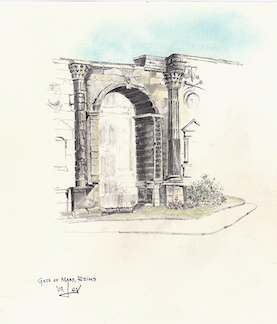 A recommendation to those of you who do not sketch - well, try and, if not, then just sit and stare, and often a building will cry out to you and reveal itself.